Overview - The most cherished work from French master Max Ophuls, The Earrings of Madame de . . . is a profoundly emotional, cinematographically adventurous tale of deceptive opulence and tragic romance. 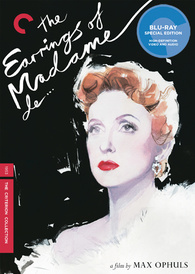 When an aristocratic woman known only as Madame de (the extraordinary Danielle Darrieux) sells a pair of earrings given to her by her husband (Charles Boyer) in order to pay a debt, she sets off a chain reaction of financial and carnal consequences that can end only in despair. 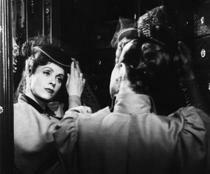 Ophuls's adaptation of Louise de Vilmorin's incisive fin de siècle novel employs the elegant and precise camera work for which the director is so justly renowned, to ravishing effect. Beneath their surface functions, most objects we buy or sell are intrinsically meaningless -- but when tied to a specific emotion or memory or even person, they can take on entirely new importance. Fueled by sentiments like love and nostalgia, clothing, trinkets, toys, and jewelry often gain abstract significance, becoming tangible symbols with deep worth that far surpass their weight in gold. In Max Ophuls' 1953 classic, 'The Earrings of Madame de...,' it is a pair of expensive but initially inconsequential earrings that gradually take on this kind of devastating value, shaping and influencing the lives of all they come into contact with. And as the story tracks the traveling jewelry on its tragically cyclical journey, so too, does the director's frequently moving camera track between his characters and sets, creating an organically shifting image that bustles with cinematic life and spirit. More than just a classic melodrama filled with tragic romance and ironic reversals, the movie is also home to a highly innovative aesthetic that continues to inspire numerous contemporary filmmakers. Loosely based on Louise Leveque de Vilmorin's novel, 'Madame de...,' the story follows Louise (Danielle Darrieux), the privileged wife of a wealthy General (Charles Boyer). After incurring a hefty debt, Louise decides to secretly sell a pair of pricey earrings that her husband had purchased for her as a wedding gift. Though the seemingly simple transaction goes off without a hitch, unforeseen complications soon occur leading to an escalating series of white lies that result in a forbidden affair. All the while, the infamous earrings repeatedly find new ways to reenter Louise's life, guiding her fate through dangerous desire and impending tragedy. Class, opulence, jealousy, humiliation, pride, infidelity, and unfettered passion all power the romantic drama, creating a precarious love triangle between the eponymous Madame, her husband, and a charming diplomat, Baron Fabrizio Donati (Vittorio De Sica, celebrated director of 'Bicycle Thieves' and 'Umberto D.'). Though each player has their flaws, the filmmakers keep their characterizations layered, making it possible to sympathize with all sides. The central relationship between Louise and the General appears simple on the surface, but ultimately holds greater ambiguity and complexity. They seem to generally care for and perhaps even love each other, but they sleep in separate beds and apparently have no physical interaction. On the one hand, their marriage is nothing but a cordial facade, but on the other, there are still hints of much deeper affection -- which go on to inform most of the third act's conflicts. As if caught in the very winds of fate, the Madame's ubiquitous earrings continually lead to a twisting web of simple, ostensibly harmless deceits. But as the items change hands, the lies are forced to build and build, until they eventually topple like a stack of dominoes. Throughout this increasing spiral of betrayal, the script carefully plays up specific bits of dramatic irony. As certain characters gain new information, others become blissfully unaware of their growing blind spots, but we, the audience, are always privy to every development, amplifying our anticipation for the inevitable, devastating reveals, which are all meticulously conveyed through absorbing performances. Danielle Darrieux is captivating as the frivolous and flirtatious Louise. Though limited by her status as a woman in a male dominated society, she is not above manipulation, and frequently uses her femininity to her advantage. An incorrigible flirt, she openly strings suitors along, but initially has no intention of actual infidelity. For his part, her husband also seems perfectly comfortable with these potentially scandalous displays, often shrugging them off with a laugh. Charles Boyer is commanding and elegant in the role, displaying great confidence and hidden vulnerability, balancing righteous indignation with a layer of blatant hypocrisy. His resolve in his marital status is so secure that no other man seems to pose a legitimate threat. That is, until Donati enters the picture. Romantic, charming, and sensitive, De Sica's performance is effortless, and he shares appropriately lofty chemistry with his illicit lover and an uneasy amicability with his scorned rival. Of course, under Ophuls' direction, this starring trio really evolves into something more akin to a quartet, as the movie's constantly roving camera becomes a character all its own. From the moment the film opens with its famous shifting POV shot, we instantly know that we're in for something special. While reframing sequences were certainly already an important piece of cinematic language at the time (Jean Renoir, in particular, was a pioneer in this regard), Ophuls takes the technique to an entirely new level. Through ambitious, extended takes and tracking shots, the director mostly does away with traditional coverage, forgoing standard cutting between close-ups, wide shots, medium shots, etc., for a more economical and deliberate approach. To this end, most scenes play out in beautifully choreographed, uninterrupted camera movements that follow the characters through their actions as they transition from room to room, shifting the frame not only left and right, but up and down as well. Angles are often composed through windows or doors, keeping the shot alive as long as possible, and cuts usually only come into play for purely functional reasons or to give added emphasis to particular beats. Despite the complicated maneuverings, these moving shots never feel artificial or forced, and instead of truly drawing attention to themselves, they become an organic part of the storytelling, enhancing the content. For example, one scene features a character attempting to go down stairs, but every time he makes his way down, he's forced to go back up again to retrieve a forgotten item. The camera moves with him during each attempt, never cutting, forcing the frame to literally retrace its steps back and forth, playfully elaborating on and mirroring the character's own back and forth movements, drawing out the humor of the scene through cinematic form. More sequences like this litter the runtime, allowing Ophuls to imply meaning and bolster drama and comedy through all his glorious tracks, dollies, pans, and crane shots. By the time the film fades to black, the Madame's fabled earrings have transformed from disposable trinkets into priceless symbols, echoing conflicting emotions of passion, heartbreak, and betrayal. The superficial has become the profound, and this costly evolution is all brought to the screen through rapturous movements and striking performances. Ophuls might not be breaking any new ground here when it comes to the basic tenants of melodrama, but his innovations in extended reframing camera shots are still influencing directors to this day. Tragic, ironic, emotional, and artfully constructed, 'The Earrings of Madame de…' is a pure cinematic treasure -- one, that like its title jewels, only gains in significance and meaning as it continues to pass from viewer to viewer. Sourced from Gaumont's 2012 restoration, the movie is provided with a black and white 1080p/AVC MPEG-4 transfer in the 1.33:1 aspect ratio. While there are some admirable qualities to the restored image, overzealous processing and manipulation have resulted in notable issues that lead to a very disappointing presentation. The print has been thoroughly cleaned, leaving a nearly pristine image free of any signs of damage. Unfortunately, this immaculate picture seems to have come at a cost. Clarity is rather soft throughout and the film has an occasionally blurry look to it. While most of this softness is likely inherent to the original photography, there are also signs of unnecessary digital filtering that leads to an unnaturally smooth and flat image. Grain is apparent, but it frequently has a faintly digitized or clumpy appearance. Likewise, facial features and other objects have a distractingly smeared, painting-like quality in several sequences (particularly the scene where the General and Monsieur Rémy first meet to discuss the earrings) that is quite distressing. These odd anomalies point to excessive DNR and unnatural digital regraining, robbing many scenes of fine detail and a filmic look. The grayscale is mostly solid with nicely balanced whites, but black levels are noticeably faded throughout. As bad as all that might sound, background details in certain scenes still remain strong, revealing intricate patterns in the ornate costumes and locations -- though one is left wondering how much more impressive these features would be with a more respectful transfer. Though the image is free of age related issues, the digital tinkering done here is troubling. Certain scenes are more problematic than others and the seemingly fake grain does work to cover up some of the usual side effects associated with DNR of this extent, but I just can't understand why this process was used in the first place. Don't get me wrong, the transfer remains watchable and even pleasing at times, but a classic of this caliber really deserves a much more authentic and respectful presentation. The audio is presented in a French LPCM mono track with optional English subtitles. Though much more respectful than the video, there is a minor anomaly worth noting. Dialogue is mostly clean and clear, but there are a few isolated sequences that feature a thin, faintly electronic resonance to speech that sounds a bit odd. On the other hand, the track is thankfully free of any noticeable crackle, hissing, or pops. Music comes through with solid fidelity but the score and modest effects work are understandably flat, with slight strain in high frequencies. Some of the dialogue can sound a little unnatural, but this is an overall clean and pleasant track that presents the audio in a respectful manner. Criterion has put together a nice collection of supplements, including a commentary and interviews. All of the special features are presented in upscaled 1080i with Digital 1.0 audio and optional English subtitles for the foreign language portions. Commentary with Film Scholars Susan White and Gaylyn Studlar - White and Studlar provide a steady and informative discussion on the film, analyzing its visuals, themes, characters, deeper symbols, and feminist aspects. Though they do tend to overanalyze some of the movie's features, the commentary is still filled with worthwhile trivia and observations about the story and Ophuls' approach to filmmaking. Paul Thomas Anderson Introduction (HD, 14 min) - 'The Master' director Paul Thomas Anderson speaks over a few quick scenes from the film, discussing the movie's visuals, characters, and themes while expressing his admiration for Ophuls' work and their great influence on his own projects. Ophuls's Collaborators (HD) - Separate interviews with assistant director Alain Jessua (25 min), cowriter Annette Wademant (7 min), and assistant decorator Marc Frederix (8 min) are presented here. The participants discuss what it was like to work with Ophuls and elaborate on his shooting and writing methods, and how he worked with actors. Production sketches are also shown of various sets designed for the film. Visual Essay by Tag Gallagher (HD, 17 min) - In this featurette, writer Tag Gallagher discusses Olphus' style and use of montage as clips from the film and other works from the director play out. Gallagher provides shot by shot analysis and elaborates on how Ophuls' visual choices enhance the story. Novelist Louise de Vilmorin (HD, 5 min) - In this 1965 interview, author Louise de Vilmorin shares her heated dissatisfaction with Ophuls' adaptation of her work, pointing out several differences from the source material that particularly disturb her. 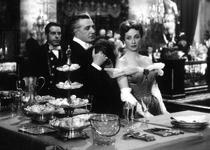 'The Earrings of Madame de…' is an enduring piece of motion picture art. Through high drama and an innovative shifting camera, director Max Ophuls crafts a heartbreaking tale about the escalating dangers of love. Though passable, the video transfer is unfortunately home to unnecessary digital filtering that does rob the movie of detail and some of its filmic texture. Thankfully, despite a minor anomaly, the audio mix is very solid and respectful. Criterion has put together a nice selection of supplements, including a commentary and interviews with some of the film's collaborators. While the movie's troublesome restoration is disappointing, the video is still serviceable and the rest of the disc is admirable. Much like 'Children of Paradise,' another French masterpiece plagued by a troublesome restoration, this release still gets my recommendation, but with notable reservations.